What costume to wear for Halloween? For many kids, it’s a difficult choice, but not so for 7-year-old Landon Browne. This year, he’s not going as a zombie or an action hero—he’s going as an NIH-funded researcher! 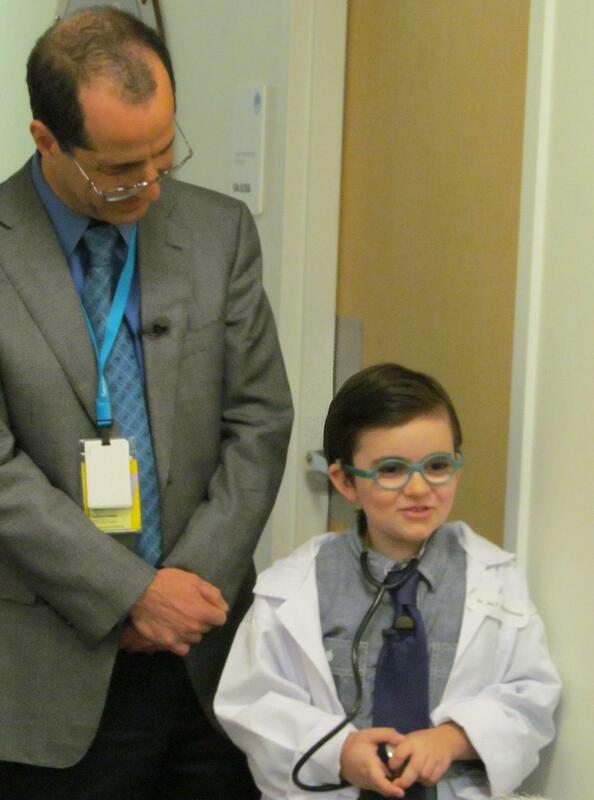 Landon, who was born almost completely deaf, has decided to dress up as his real-life superhero: Jay Rubinstein, M.D., Ph.D., a physician-scientist at Seattle Children’s Hospital who performed the surgeries that have enabled the boy to hear. Landon’s dramatic journey began six years ago when Dr. Rubinstein inserted a cochlear implant into his right ear. The implant, which has an external portion that sits behind the ear and a second portion that is surgically placed under the skin, translates sounds into electrical impulses that directly stimulate the auditory nerve inside the ear. Just nine months old at the time, Landon became the first patient enrolled in Dr. Rubinstein’s pioneering studies that investigated exactly how and what babies with cochlear implants are able to hear. The latest chapter in this action story came last summer, when Dr. Rubinstein inserted an implant into Landon’s left ear. After receiving the implants, along with early intervention speech and listening training, Landon is able to perceive speech and rhythm quite well. In fact, when you listen to him speak, he sounds just like any other smart child his age. And Landon’s not alone. He’s just one of the more than 70,000 deaf people in the United States—and more than 220,000 worldwide—who have benefited from cochlear implants. Whenever I hear success stories like Landon’s, I’m proud of the pivotal role that NIH played in the development of the modern cochlear implant. In fact, just last month, Graeme M. Clark of the University of Melbourne, Australia; Ingeborg Hochmair of MED-EL, Innsbruck, Austria; and Blake S. Wilson of Duke University, Durham, N.C., received the prestigious 2013 Lasker-Debakey Award in Clinical Research for their contributions to this groundbreaking biomedical achievement. Clark and Wilson are NIH grantees. But there’s more work to be done, because Landon still can’t hear everything that most of us hear. Cochlear implants fall short when it comes to perceiving pitch and melody, as well as picking up speech in a loud environment. Still, that hasn’t stopped the second-grader from taking guitar lessons, providing a bit of extra encouragement for Dr. Rubinstein and his colleagues at the University of Washington in their ongoing efforts to improve the implants’ software to boost music perception. Dr. Rubinstein, who also plays guitar, says enhancing music perception is about much more than giving people with cochlear implants a chance to enjoy Beethoven or Beyoncé. In fact, he says music is one of the most complicated sounds that humans perceive. 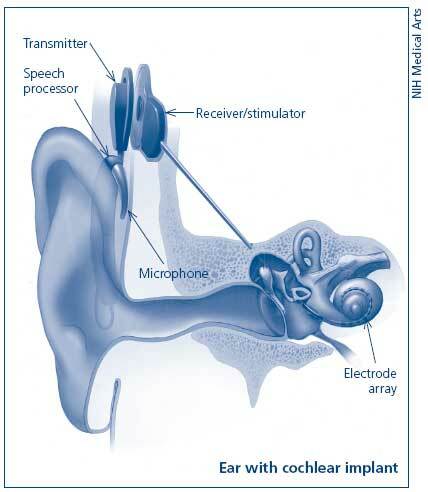 So, if we can improve music perception, then cochlear implants should be better at translating all sounds. Yes, but let’s hope that the “NIH-funded researcher” doesn’t become a ghost of science past….